Have you ever wondered what a plant feels like when it’s illuminated during photosynthesis, drawing in the electricity of the sun? Light is a necessary nutrient for us, too, and many of us languish during the light-poor winter months, but here is an art exhibit to enliven and inspire even those most in the doldrums of seasonal affective disorder—Signs of Life, an exhibit of cameraless, lensless, computer-free photograms by Robert Buelteman, showing at Sanchez Art Center from February 24 through April 1.
on Sunday, April 1, at 4 pm. Robert Buelteman was an accomplished black-and-white landscape photographer for 25 years before he had an epiphany in the Arizona desert that inspired him to change course. He had foreseen his artistic life as a straight, predictable path ahead, and knew he needed a new direction. The ghost of Buelteman future did not appeal to him, and he decided to create a closer and more direct involvement with his subject and his medium. He chose to begin anew, setting aside his camera, and searching for a new way to directly image the life force. Buelteman drew from the techniques of Kirlian photography (photographs of auras, the electrical emanations of living beings), and developed his own unique, back-to-basics relationship with his medium and the world of nature. The resulting artworks are breathtaking, and worlds away from his earlier black and white landscape photographs. It’s not an easy process. 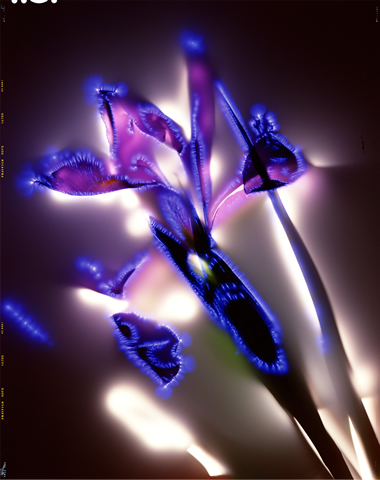 Buelteman began experimenting with taking pictures by laying a plant or flower directly on a large plate and running electrical current through it to produce an image that is all about light and color. He wanted to work larger than most Kirlian equipment would allow, so he found an engineer to build a generator that could drive an image over 80 square inches. Buelteman then constructed his own super-sized easel made of aluminum sheet metal floating in a solution of liquid silicone and sandwiched between pieces of 1/8-inch-thick Plexiglas. Then he located 8-by-10-inch tungsten-balanced color transparency film, and the work began. Buelteman sculpts his plant subjects into the desired thinness to display on the plate, and uses high-voltage electrical pulses to capture the images. He also adds light sources, literally painting with light using a fiber-optic probe the size of a human hair, to enhance the light and color he chooses to emphasize. Read more about his work on www.buelteman.com. For over a decade, Buelteman has been attempting to perfect his process, working as a guest at the Santa Fe Institute in New Mexico and under the auspices of the Djerassi Resident Artists Program in northern California. 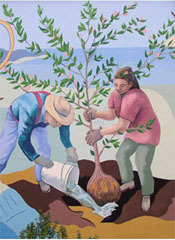 His work can be found in the permanent collections of the Yale University Art Museum, the Santa Barbara Museum of Art, Stanford University, and numerous corporate collections. He has now shown these stunningly beautiful, light-filled images in more than 35 countries, and has published four portfolios of this colorful work, one of which bears the name of this exhibit at Sanchez Art Center, Signs of Life. This catalog will be available for sale at the Sanchez galleries. We are delighted to host this new exhibition of his inspiring work. Signs of Life opens Friday, February 24, with a reception for the artist from 7 to 9 pm, and will be on display through Sunday, April 1. Gallery hours (after the reception) are Friday, Saturday, and Sunday, 1–5 pm. Sanchez Art Center is located at 1220 Linda Mar Blvd., Pacifica, California, about 1.5 miles east of Highway 1 and the Pacific Ocean.